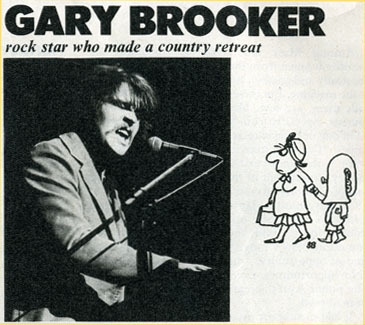 Extraordinarily, Gary Brooker was the subject of a two-page spread in the UK's She magazine, some time in about 1987. Thanks to Peter Cohen for spotting and preserving this remarkble piece. 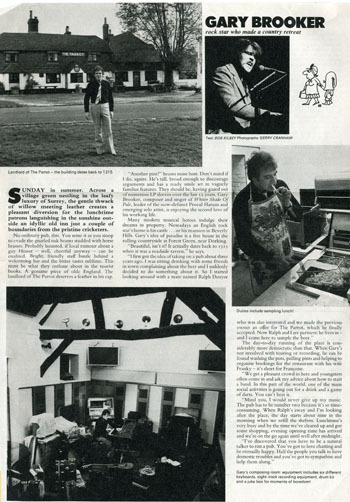 The typed captions below reproduce the original text from the magazine. Sunday in summer. Across a village green nestling in the leafy luxury of Surrey, the gentle thwack of willow meeting leather creates a pleasant diversion for the lunchtime patrons languishing in the sunshine outside an idyllic old inn just a couple of boundaries from the pristine cricketers. No ordinary pub, this. You sense it as you stoop to evade the gnarled oak beams studded with horse brasses. Probably haunted, if local rumour about a gay Hussar – well, cheerful anyway – can be credited. Bright, friendly staff bustle behind a welcoming bar and the bitter tastes sublime. This must be what they enthuse about in the tourist books. A genuine piece of olde England. 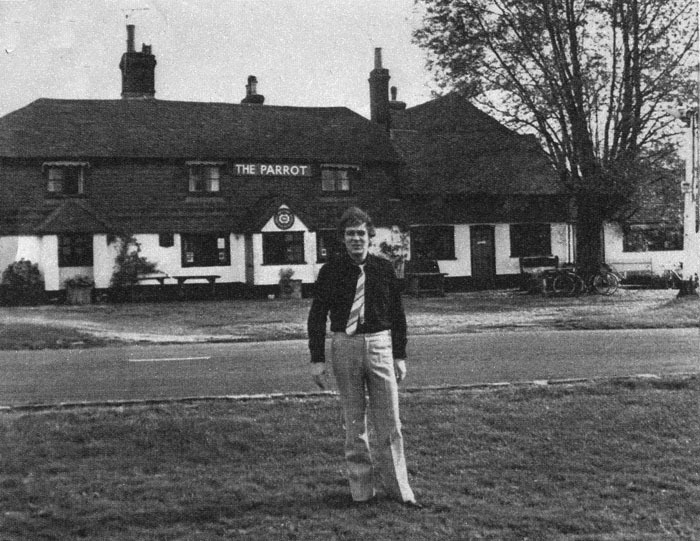 The landlord of The Parrot deserves a feather in his cap. “Another pint?” beams mine host. Don’t mind if I do, squire. He’s tall, broad enough to discourage arguments and has a ready smile set in vaguely familiar features. They should be, having gazed out of numerous LP sleeves over the last 12 years. 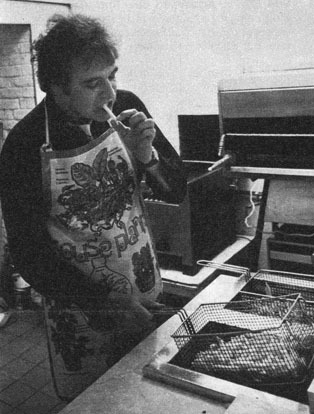 Gary Brooker, composer and singer of Whiter Shade Of Pale, leader of the now-defunct Procul [sic] Harum and emerging solo artist, is enjoying the second love of his working life. Many modern musical heroes indulge their dreams in property. Nowadays an English rock star’s home is his castle … or his mansion in Beverly Hills. Gary’s idea of paradise is a free house in the rolling countryside at Forest Green, near Dorking. “Beautiful, isn’t it? It actually dates back to 1315 when it was a roadside tavern,” he says. The day-to-day running of the place is considerably more democratic than that. 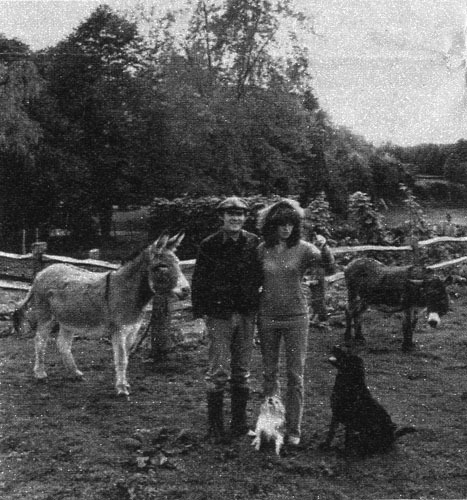 When Gary’s not involved with touring or recording, he can be found washing the pots, pulling pints and helping to organise bookings for the restaurant with his wife Franky – it’s short for Françoise. 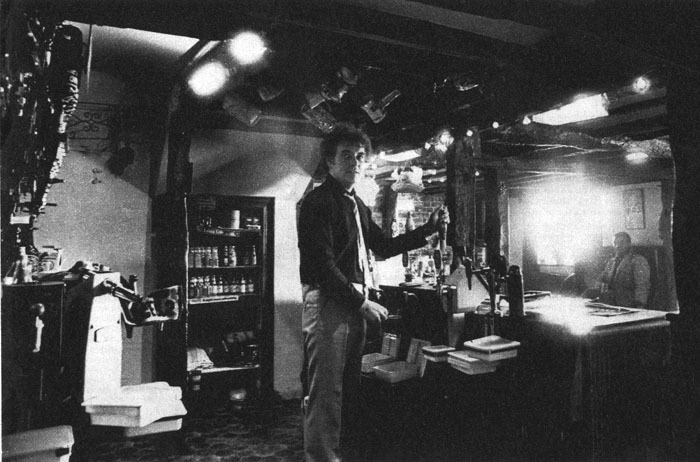 “We get a pleasant crowd in here and youngsters often come in and ask my advice about how to start a band. In this part of the world, one of the main social activities is going out for a drink and a game of darts. You can’t beat it. “Mind you, I would never give up my music. The pub has to be number two because it’s so time-consuming. When Ralph’s away and I’m looking after the place, the day starts about nine in the morning when we refill the shelves. Lunchtime’s very busy and by the time we’ve cleared up and got some shopping, evening opening time has arrived and we’re on the go again until well after midnight. Verbal moral support may be there for the asking, but in reality very few patrons of The Parrot are likely to be in urgent need of it. By most standards, the locals who frequent Forest Green’s favourite hostelry would seem to be making their way in life with more than a modicum of success. There’s that tall, bearded fellow from just up the road who often stops by for a few pints. Eric Clapton’s the name. Plays guitar well. The kids call him God. Or you could find yourself rubbing T-shirts with the extrovert character who keeps popping up on the telly sporting a rainbow-coloured Afro wig. He’s something in the pop business as well. Sipping a tonic water over there in the corner – Jonathan King, that’s the bloke. 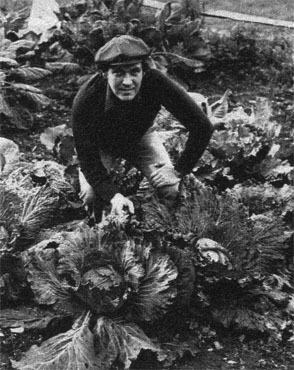 Progress for Gary Brooker is a solo career which has been smoothly launched with an album entitled No More Fear Of Flying. It was produced by George Martin, whose studio work with the Beatles ensured his place in rock’s hall of fame. The LP contains two songs by Gary’s grossly-underrated Southend contemporary Mickey Jupp as well as some Brooker contributions and a cover of Murray Head’s Say It Ain’t So, Joe which nudged the singles charts. "I’m more than happy with the album. I love the sound of it,” Gary enthused. “I’ve known George Martin since the early days in Southend when I used to play in the Paramounts with Robin Trower. George is great to work with and he had a big part in choosing the material. He came up with the string arrangements, too. “The words on the new songs are probably more accessible than some of Procul’s [sic] tracks. The next step is to see how things go and perhaps set up a tour, using the musicians who played on the album. This particular inn-keeper clearly relishes the overlap in his interests … a high spirited blend of music, good food and fine beer. 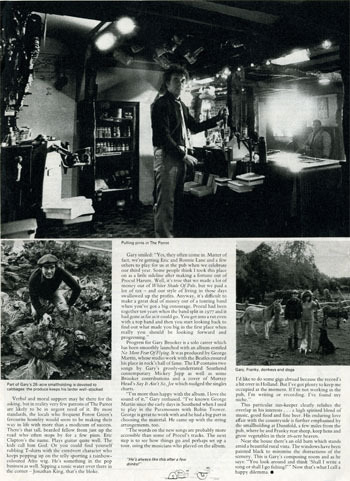 His enduring love affair with the countryside is further emphasised by the smallholding a few miles from the pub, where he and Franky rear sheep, keep hens and grow vegetables in their 26-acre heaven. Gary’s composing room: equipment includes six different keyboards, eight-track recording equipment, drum kit and a juke box for moments of boredom! Near the house there’s an old barn which stands amid a beautiful rural vista. The windows have been painted black to minimise the distractions of the scenery. 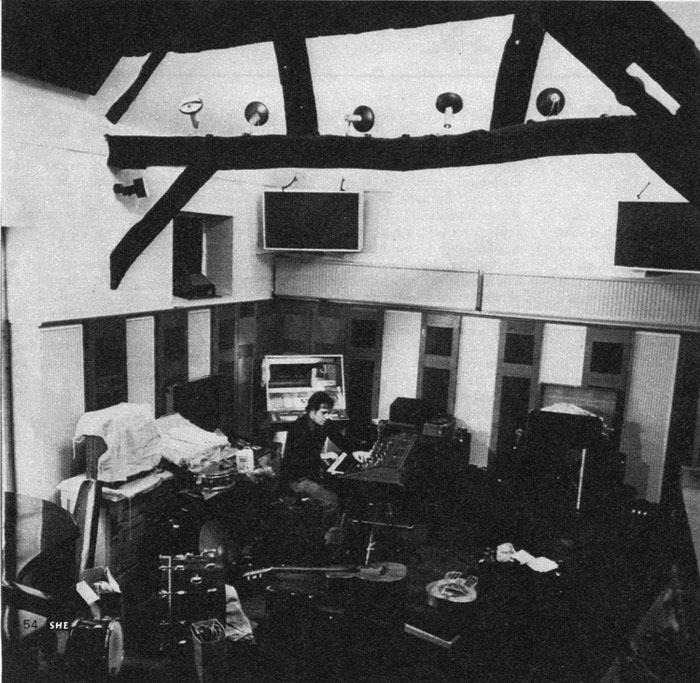 This is Gary’s composing room and as he says: “You look around and think ‘Shall I write a song or shall I go fishing?’” Now that’s what I call a happy dilemma.